ViMarkets proprietary technology enables our community of Citizens to re-create their lives virtually through the purchase of Virsions. (Virtual 3D Assets) The retail marketplace for e-commerce is inefficient. Browsing has shifted from Desktop to mobile, worsening the already biggest threat to online retail commerce -Shopping Cart Abandonment – to a now $6.4 Trillion dollar problem. ViMarket is offering a solution beneficial to retailers, shoppers, developers and marketers, alike. Our solution is a hybrid of disruption to wish-lists, social influencer marketing, loyalty and rewards programmes, utilizing innovative new technology through the creation of new immersive experiences. ViMarket wants to heighten purchase aspirations and better track this path-to-purchase, whilst enabling citizen’s trends to be visible to others via our 3D asset-marketplace of merchant sponsored products. The formation of ViMarket UK Ltd as a specialized service company, is the result of the exploration of high technological advancements in 3D content creation, virtual and augmented reality, artificial intelligence and machine learning. ViMarket visualize mankind’s purchase aspirations, by transforming the traditional 2D retail browsing experience into immersive VR, via editor and configured by our Station and Citizen builder tools. Our insight into the world’s future consumer retail aspirations, maximize engagement and exposure to merchant sponsors via VIMI’s basket tracker, enabling an attack on the growing challenge of shopping cart abandonment, accounting for $6.4 trillion in losses per year. With over ten years of research and development in and around consumer consumption, we are building the largest asset marketplace to service the media and entertainment, healthcare, automotive, and big box retail industries on the backs of our innovative professional designer community. This asset market place will be available to consumers (citizens) and retailers (merchant sponsors) who together, will contribute to the virtualization of new experiences (Virsions) that ultimately reflect a person’s wants and desires. This is designed to create a new form of advertisement for our merchant sponsors, wishing to reach new markets via plugging into our immersive experience. By working in partnership with our community of influencers, VIMarket will introduce an asset store of 3D objects that can be purchased with the intention to create an opportunity for the created virtual goods and services to be exposed within an immersive environment to consumer shoppers, containing the merchant sponsors and content creators stock, in return for rewards and discounts towards real-world item purchases. Stage 1 of our journey is content creation. ViMarket will provide communities across the world with limited to no development experience, the ability to create and showcase their work for merchant sponsors, via our ViMarket repository. 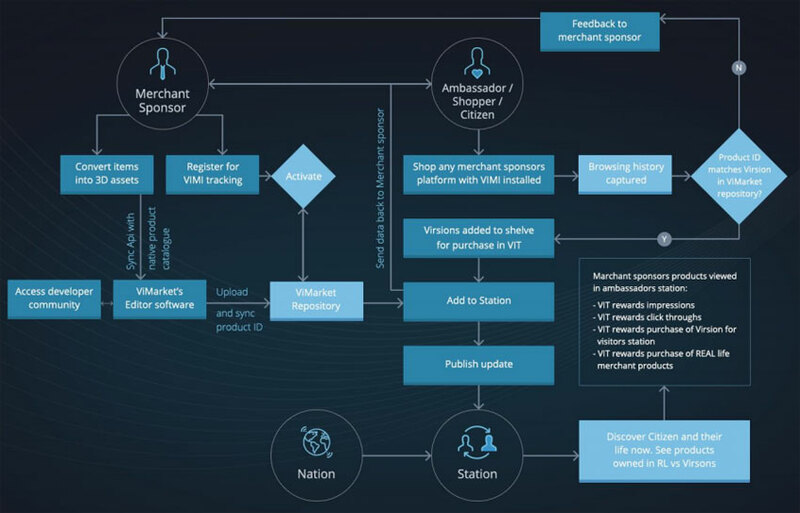 This inventory will activate customer influencers (Citizens) to express themselves through building stations, comprising of current purchases or future aspired wants targeting new visitors as the ambassadors for merchant sponsors. At stage one, the solution and catalyst to 3D content creation, is via the launch of our editor software (editor.vimarket.io) providing 3D modellers anywhere in the world, the ability to contribute and monetize their creations. ViMarkets 3D editor is a web based application that allows users to create, animate and render 3D content on any compatible device. It is created by Vi Market UK LTD and their collaborators who are known for their creative plugins for Softimage, Maya and 3ds Max.